Also known as a "swedish" Massage, smooth gliding strokes at a slower pace are used with light pressure to help you relax. Less emphasis is put on "working out" knots and incorporates the full body for complete relaxation. This type of massage is ideal for first timers or those that simply want to let go and recharge! Deeper pressure is used to help release chronic muscle tightness. The focus of this massage is on the deeper layers of muscle, tendons, fascia, bones and joints. This type of massage is great for those who suffer from chronic aches and pains. This is a deep tissue massage that focuses only on the problem areas of the client. more attention is spent on trouble spots like the neck, back, or shoulders. This is not a full body massage and it can be added to any other massage in 30 min increments for $20. A massage that focuses on the special, unique needs of the mother to be as her body goes through the dramatic changes of pregnancy. This massage enhances the function of muscles and joints, improve circulation, and reduce mental and physical fatigue. Must be at least 16 weeks to schedule a massage. 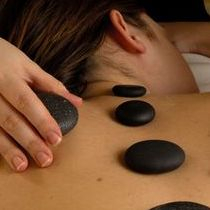 Hot stones are placed strategically on the body and used to increase blood circulation and relax muscles. this allows the therapist to access deeper muscle layers. Combining hot stone protocols with a full body massage provides a very healing and effective experience.